My name is Reverend Tony Pierce, and I am co-senior pastor of Heaven’s View Christian Fellowship in Peoria, Illinois and Board President of Illinois People’s Action. On Monday, together with forty grassroots leaders from across Illinois, we shut down the morning session of the Environmental Protection Agency’s sole national hearing on their so-called “Affordable Clean Energy” plan. We took over the hearing because the EPA’s plan is, in fact, a dirty energy scam that will worsen environmental racism and pollution in our communities. By the EPA’s own numbers, the plan will kill as many as fourteen hundred – FOURTEEN HUNDRED – of our families, friends and neighbors each year. This “plan” gives dirty energy giants free rein to release millions of tons of CO2 and pollutants into the air. Trump’s EPA has no shame. First, they mislead those most harmed by this plan – the poor and communities of color – with its sweet-sounding name. Then they schedule a single opportunity for the millions like me across the nation who are impacted by it to speak out. The EPA, with this dirty energy scam, has gone way beyond business as usual. They’ve dropped all pretense of trying to protect the environment, and are now actively committing to a full assault on communities like mine that live and struggle to breathe in the shadow of dirty power plants. Our action was our way of showing that our communities will no longer tolerate our lives and health being rendered disposable in the service of corporate profit. 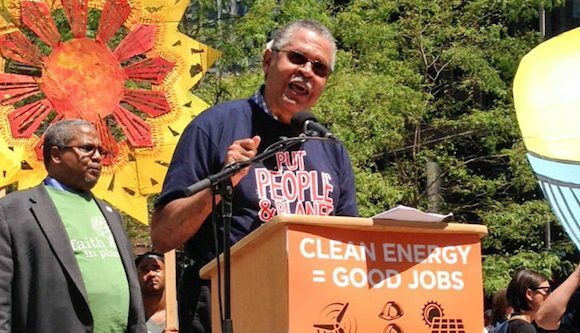 It is shameful that communities of color, like mine, already bear the burden of dirty energy pollution. It’s beyond shame that we are now treated with such contempt by our own government and the agencies charged with protecting our health, when they silence any voice that dares to speak up against them. We have been telling the EPA for three long years, at every opportunity, what we really need. What we need and deserve is the polar opposite of this proposal. We need bold and ambitious action to protect the poor and communities of color from pollution. We need renewable energy sovereignty that economically empowers our communities. In Illinois, we have no choice: we can’t wait, we’re fighting back. After two long years of negotiation with our General Assembly, we fought for and won the Future Energy Jobs Act, which is investing $750 million over ten years in training to create clean energy jobs and spark new investment in wind and solar power. We’re creating our own green jobs here and now, in Peoria and all across Illinois. Our plan also includes a community solar program, so entire neighborhoods can enjoy the benefits of solar energy. Households can enter into agreements to help fund solar energy installations in their neighborhood, whether or not they can afford their own rooftop solar panels and then share in the proceeds generated by that installation. These are the kinds of creative solutions that we can, and should, implement now. They’re within reach. We know, because we’re doing it ourselves. But we shouldn’t have to fight dirty polluters and our own government, too, to create a sustainable future for our children. On Monday, the voices of my brothers and sisters from Illinois People’s Action and The People’s Lobby rang out through the halls the of the Robert Metcalfe Building, as we held the EPA to account and spoke our truth. When security asked us to leave, we left to applause – and I’m glad that there were some more patient experts and politicians – like Washington Governor Jay Inslee and Gavin McCabe from the New York State Attorney General’s office – who were willing to travel from across the country to testify at the hearing about the harm the EPA’s plan will do. But impacted communities like mine are past patience. It is time – now – for the Trump administration to stop ignoring the poor and people of color. We demand that the EPA go back to the drawing board. Go back, listen to our testimony, and the comments submitted by hundreds of thousands of people from communities like ours, and hold real community input hearings across the nation. Create a plan NOW that actually listens to what we’ve been saying – not a scam like this, which only promises us more pollution, more misery and more death.